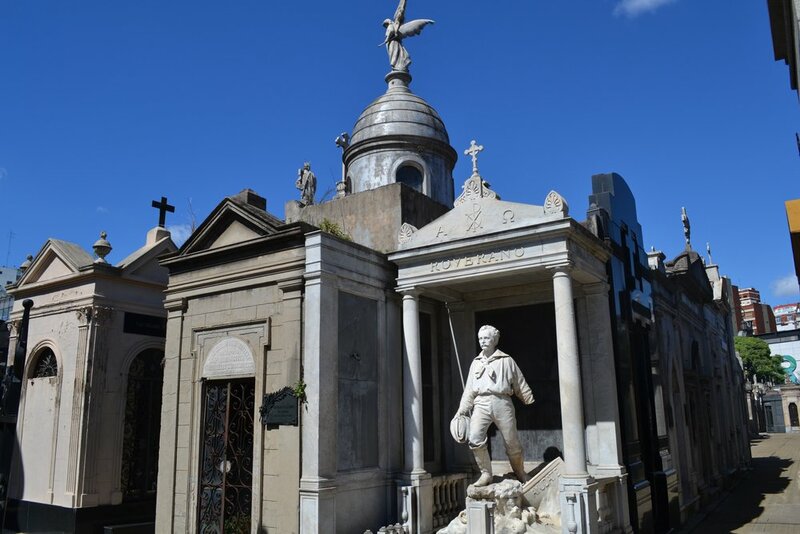 I was recently interviewed by ROL Cruise, which is an independent cruise specialist that helps people develop a travel itinerary for the perfect cruise, on my experience visiting La Recoleta Cemetery in Buenos Aires. Feel free to check out their website and blog! I don't consider myself to be macabre or goth in any sense of the word. I also don't typically spend my leisure time hanging out in cemeteries or anything like that although I know people who do indeed do that (to each his own). However, when I travel, I will admit that I have visited a variety of dark sites, such as the Capuchin Crypt in the church of Santa Maria della Concezione in Rome, the Auschwitz-Birkenau concentration camp in Poland, and the abandoned and irradiated town of Pripyat in Ukraine. My motto tends to be "if its interesting, I'll check it out." 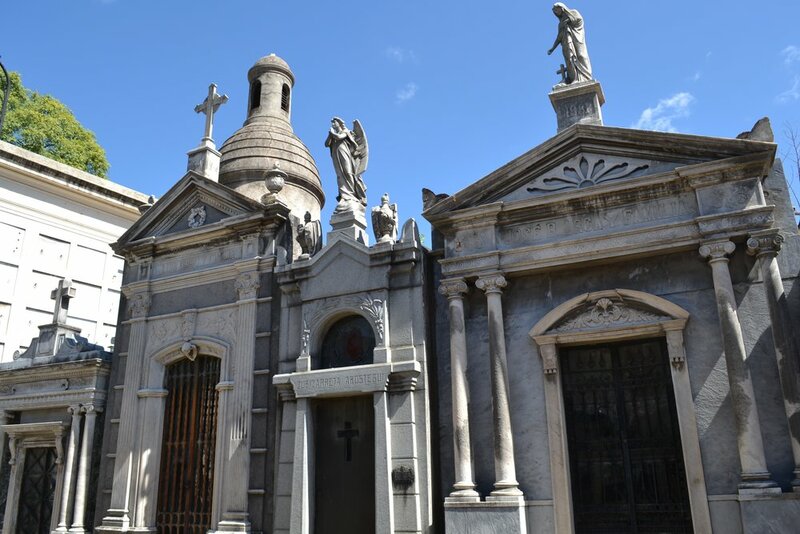 Therefore, when I visited Argentina for the first time in March 2017, I knew one of the biggest and most popular tourist attractions in Buenos Aires was La Recoleta Cemetery. When I stayed in Argentina, I based myself in the San Nicolas neighborhood, which is mainly the financial sector of the city although it also has its fair share of government buildings. The area of San Nicolas is a nice and central location, and it is a relatively easy walk to most places in the city if you don't want to deal with taxis or public transportation. Even though I saw a lot of wonderful sites while in Buenos Aires, the one place that I really wanted to see was the famed La Recoleta Cemetery. 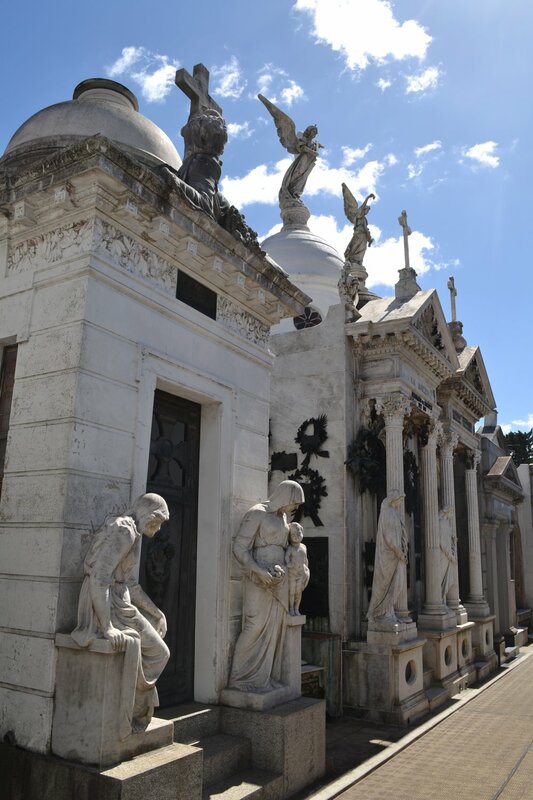 Luckily for me, the cemetery itself is located in the Recoleta neighborhood of Buenos Aires, which is just north of the San Nicolas neighborhood and which happens to be home to some of the best historical architecture and real estate in the city. Because of its relative closeness, it was not a very far walk from my hotel to the cemetery (20 minutes or so). Even though it would have been far faster and easier to take a bus or a taxi, I often prefer to walk to most places since it helps me navigate a bit easier since walking forces me to pay attention to streets, and I can get a better sense of direction. After a lot of walking down one of the main streets in a relatively hot sun, I eventually reached the gates of La Recoleta Cemetery. 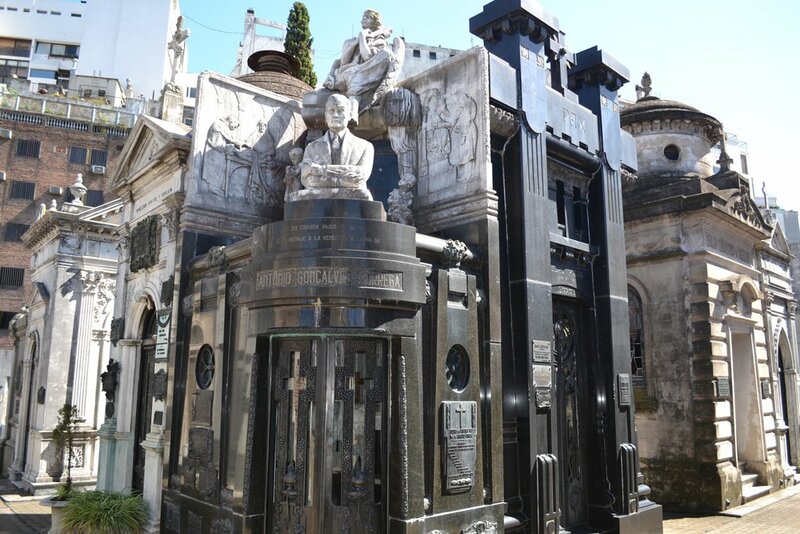 The cemetery is probably one of the most famous cemeteries in the world since it is the final resting place of many prominent Argentines ranging from presidents, military heroes, and other prominent figures such as various writers, scientists, artists, actors, and actresses. Essentially, the cemetery holds a veritable who's who of famous and notable Argentines in a relatively small area (14 acres). In addition, because of its relatively unique aesthetics and layout, it is often ranked as one of the most beautiful cemeteries in the world. Despite its renown, the cemetery has no entrance fee, so you don't have to worry about paying admission. Upon entering, it is possible to take a tour that visits some of the more graves in various languages. When I arrived, a tour in English was about to start, but I decided to skip it since I prefer to explore on my own. The first thing that struck me when I first entered the cemetery was how crowded everything was. It looked nothing like what I would typically see in a US cemetery; even older ones. Unlike in the US where gravestones are generally arranged neatly in rows with a decent amount of space between graves and every tombstone looks pretty much the same, it was completely different in La Recoleta Cemetery. Here, pretty much every tomb is in the form of a private mausoleum that belongs to a family. On many of the mausoleums is the inscription "Familia...." It was interesting for me to learn that many of these mausoleums are still being used by the families and are added to when a member of the family dies. Because they are still being used, it is clear that several of them are well-taken care of in terms of cleanliness although the opposite is also true of those mausoleums that are no longer acquiring new residents. As I wandered around the cemetery, it was very clear that this was a veritable city of the dead. The thousands of mausoleums packed into the space gave the impression of walking down a city street, and it was amazing to see the huge variety in designs of the different mausoleums. A lot of the mausoleums that dated from the late 19th to early 20th centuries often had gothic designs whereas the newer mausoleums were much more modernist and minimalist. It was not unusual to see a recently built mausoleum from maybe the 2000s next to one that had maybe been built in the 1890s or so. While there were many fascinating things to see in the cemetery; for me, the most fascinating thing was that it was very common to see the caskets, especially in the older mausoleums out in the open. A lot of the older mausoleums often had a gate (sometimes locked or unlocked), and it was possible to see caskets of all sizes lying on shelves through the grating. It was clear from the appearance of many of them that they had been sitting in those same spots for decades or even for over a hundred years. A lot of them were extremely dusty with rusted or broken coffin handles, and some even looked partially broken with parts that looked broken and busted open. This was something that I had never actually seen before. In addition, a lot of the older mausoleums were often very dirty with a lot of trash and broken glass lying on the floor. It was clear that they had fallen into disrepair. Even though a lot of the older mausoleums tended to have fallen in disrepair with the caskets often in poor condition and out in the open for anyone to see, the newer mausoleums were somewhat different. Generally, because they were probably still being used, they were much cleaner and had the caskets mostly put underneath the floor in organized shelves that could still be seen from the entrance of the mausoleum. There were many newer mausoleums that had steps leading to a lower level, and it was sometimes possible to see the caskets still on shelves but a little more hidden. Also, unlike the older mausoleums which often had broken windows, the windows on the newer mausoleums were intact and often very clean with very little trash. In addition, because the mausoleums are placed so close to each other, and space is at a premium, many of the caskets are placed extremely close to the gates of each mausoleum entrance. To be honest, it would not have been difficult to reach through the locked gates and easily touch some of them. In some cases, the gate was either unlocked or completely open, so it would have even been possible to enter into the mausoleum itself. Now, even though I am not particularly religious, I believe in letting the dead rest without interruption and maintaining a sense of respect. Because of that, I made sure to keep my hands to myself and did not touch any of the caskets, nor did I make any attempt to enter into any of the mausoleums even if they were open. To me, that would be seen as a breach of decorum seeing how I have no relation to anyone interred there. It should also be noted that caskets were not the only things present in a lot of the mausoleums. Aside from the usual flowers, photos of the deceased, and various religious items, such as crosses, grave candles, and rosaries, there were also a significant number of urns for those family members who were cremated but wanted to be entombed in the same place. Therefore, it was not uncommon to see a mausoleum with the caskets on shelves, and the urns placed either on top of them or on tables or altars inside the mausoleums. During my explorations, I came upon the graves of presidents and other prominent Argentines. Admittedly, my knowledge of Argentine history is quite limited, so I probably passed by a lot of famous Argentines that I was not familiar with. In a handful of the tombs, it was possible to see the caskets with the flag of Argentina draped over it. I cannot be 100% certain, but I assume these were the graves of well-known Argentines that had some political or national role. Of course, because this cemetery is a major tourist attraction and still a working cemetery, it was not uncommon to see cemetery workers repairing or doing cleaning in various mausoleums. In a newer mausoleum that I passed by, I happened to look down down the steps where the bodies are and saw one of the cemetery workers using a standard household duster on several pristine caskets that were stacked neatly on shelves. To me, seeing a worker nonchalantly dusting off caskets that held bodies was something I don't typically see each day. Even though La Recoleta Cemetery holds the earthly remains of many famous and well-known Argentines, the most famous grave in the entire cemetery is that of Eva Peron, who was the wife of Juan Peron, who served as the President of Argentina from 1946 to 1955. While the Perons have a controversial history in Argentina today, Eva Peron in particular, is still loved by many Argentines and others throughout the world as evidenced by the musical and film, "Evita." When I found her grave (Duarte is her family name), there was a line of people waiting to see it, and while waiting my turn to see it, I distinctly remember one older woman standing near me singing the famed "Don't Cry for Me Argentina" from "Evita" to herself. Because of the line, people were expected to file past, take a couple quick pictures, and then move on. Despite Eva Peron's fame throughout Argentina and the world, her tomb was around the same size as the other mausoleums in the area. The only difference was that this had a lot of commemorative plaques whereas most of the other mausoleums only had one or two plaques. It also supposedly one of the most secure tombs in the world since the body of Eva Peron has disappeared several times since her death, and the government is keen to keep her body secure and not let it disappear again. While I only planned to spend about a half hour or so checking out La Recoleta Cemetery, I ended up spending about an hour and a half there since it was incredibly easy to go off on different paths and see something new. If I had to be honest, this was probably one of my favorite parts of visiting Buenos Aires. I would definitely like to return and more thoroughly explore the area since there is so much history packed within the small confines of the cemetery. 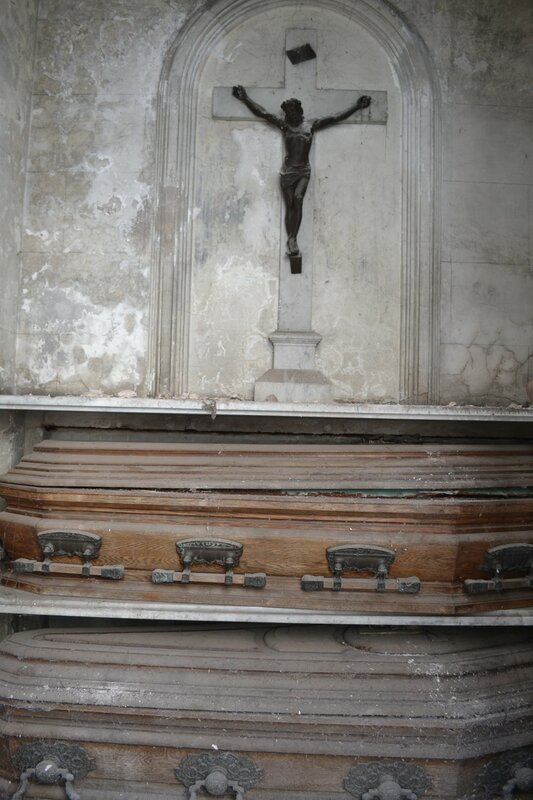 Have you ever visited La Recoleta Cemetery? What did you think of it? Please enjoy the photo gallery below. All photos were taken by me with a DSLR and iPhone.